The technology we currently use to build the tables is sometimes unstable and introduces misalignments between the title and the other items. The new code will make the interface far better and robust. The current layout makes reading quite difficult, especially when patent families are large or if there are too many columns. The new and more compact list template will simplify the view while maintaining the ability to see at a glance the status of family members (see indicator under the title). 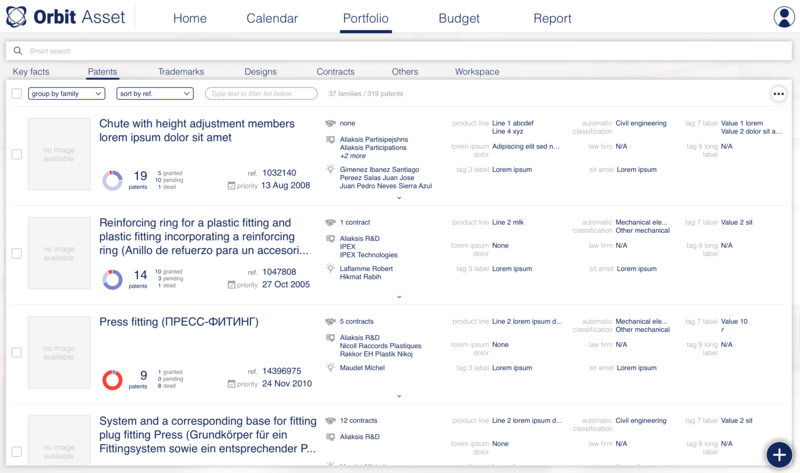 The menu, currently on the left has been moved the top to offer an easier and more intuitive access to all options: list of patents, trademarks, designs, contracts and other types of titles (know-how, software, databases).